AM-1 Roofing is a family owned and operated business with unparalleled expertise. We have been serving Central Oregon since 1993 in our red trucks all over town. As a Bend Oregon roofing contractor, we understand what your home means to you. There are no commercial or residential roofing jobs too large or too small for the crew of AM-1. AM-1 has built a solid reputation with renovating, repair, and installation of roof systems, siding, gutters and steel buildings. The trained specialists at AM-1 can help with condensation issues, poorly designed roof systems and improper ventilation. 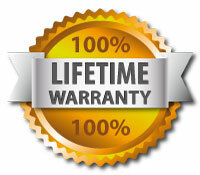 With Am1 Roofing's Lifetime Warranty we have your home litterally covered! Large or Small projects, we solve all siding issues. We have advantages over Gutter-Only companies! Over 10 years experience constructing & design of steel buildings.